"Watch out! 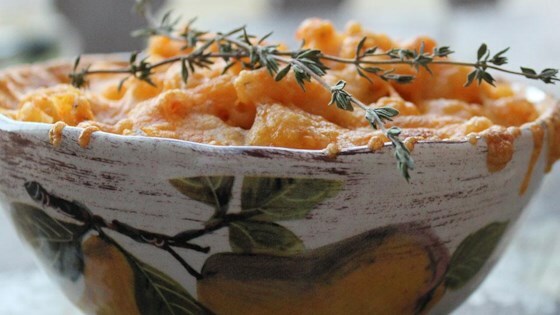 This delicious macaroni and cheese recipe will have you making mac 'n' cheese from scratch instead of from a box forever. You and your family will be enjoying the warm, creamy, cheesy, comfort-foody deliciousness quicker than you think-perfect for a school night! And with the surprise of a bit of Mexican flavor, you'll be number one in their books." Bring a large pot of lightly salted water to a boil. Cook elbow macaroni in the boiling water, stirring occasionally until tender yet firm to the bite, 8 minutes. Drain. Whisk milk and flour together in a small bowl. Melt butter in a large heavy pot over medium heat. Pour in milk/flour mixture; stir constantly until thickened. Add most of the cheese, reserving a few tablespoons to sprinkle over top before baking. Mix in drained tomatoes, and salsa verde. Continue stirring until cheese is melted. Season to taste with black pepper. Stir in macaroni and thoroughly blend with the sauce. Divide among individual serving-sized ovenproof baking dishes or ramekins. Top with remaining cheese. and bake 10 minutes. Place under broiler for an additional 3-5 minutes, or until top is browned. Bake in preheated oven until hot and bubbly, about 10 minutes. Turn on the broiler and cook until tops are browned, about 2 to 3 minutes. Toned down the spiciness in the salsa verde due to my wife's request, then added some hot sauce to my bowl. Nevertheless felt like it was missing something, meat? This was delicious! It had a kick, but not too much that my kids couldn't handle it. I used a little less pasta after reading one of the other reviews, and it turned out saucy and delicious! Simply put this is pure comfort food. Followed the directions of the submitter and this came out perfect! Really delicious!!! I used a little less salsa verde to appease the skeptics of spiciness in the family. Tasted great and kids considered it “legendary”!! !